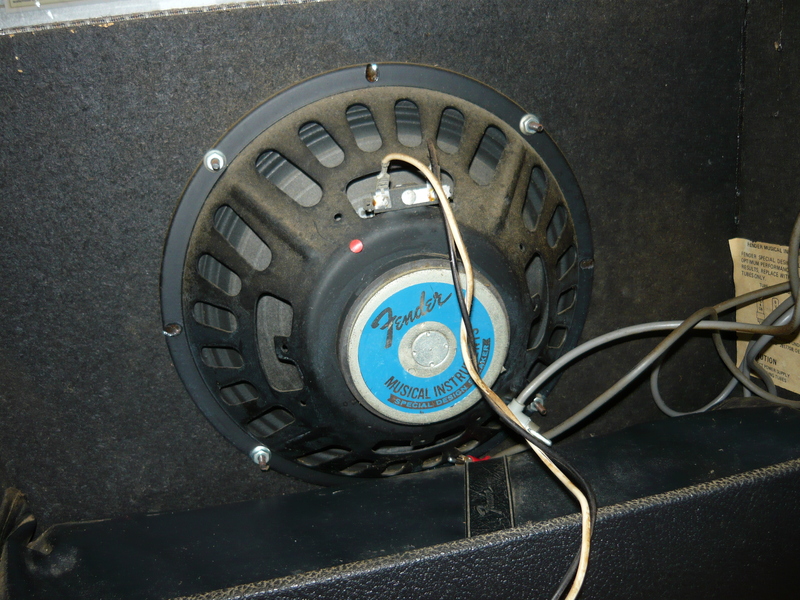 A customer brought in a recent acquisition – a late 1970’s Silverface Fender Princeton Reverb 1×10 combo amplifier, serial # A816986, for a complete overhaul & safety check. 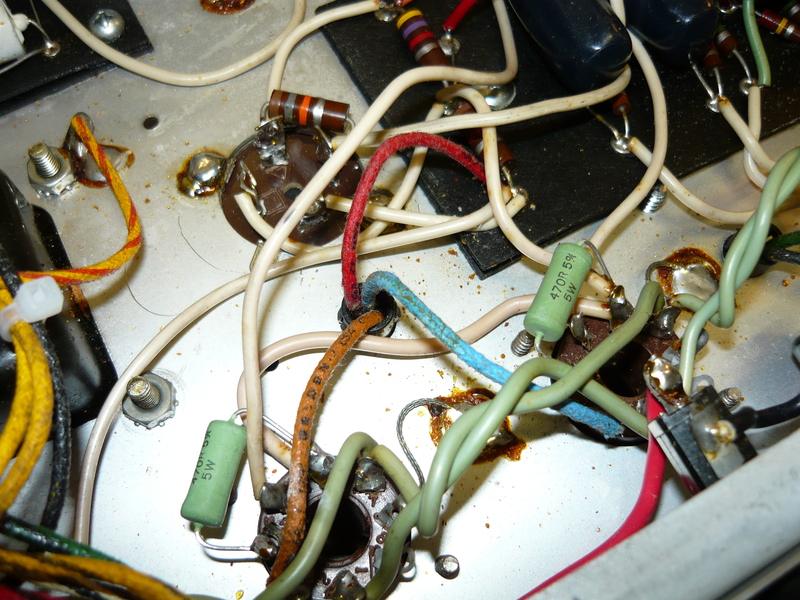 This amp was obviously in pristine condition, probably stored somewhere nice & dry in recent years without much use, and has rarely, if ever, been serviced. This could be a blessing in disguise, as the amp has remained all original with no dodgy repairs or modifications to deal with. Ben advised us that the amp was farty and all the pots were very scratchy and cutting in & out. Before we even got to an appraisal of the chassis and electronics, we discussed with Ben the options for a suitable upgrade speaker unit, as the stock speaker in these amps is very ordinary, especially after 30+ years. As you can see from the photo on the left, Ben accepted our recommendation to supply and install the Celestion G10/Vintage in this amplifier. 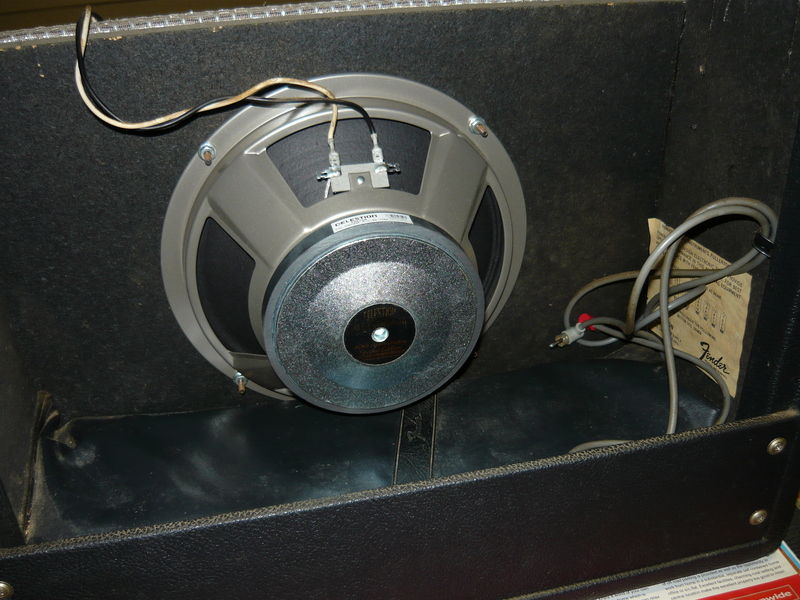 Regular readers of this blog will know that we enthusiastically recommend certain speaker units by Weber, WGS and in certain applications Jensen Neo 10 & 12-inch speakers. 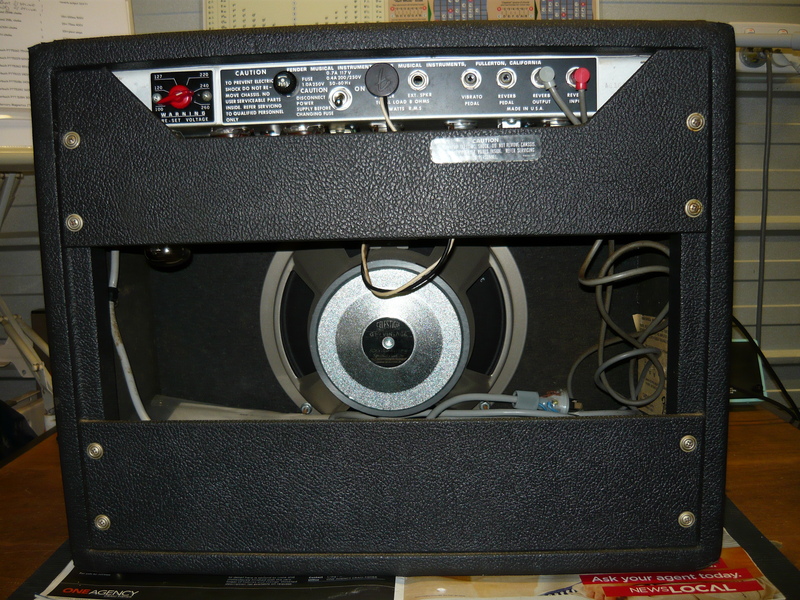 We will also be trying out some Scumback speaker units in the coming months. However, in this amplifier upgrade the G10 is a very cost effective choice, which fills in the previously missing details in the lows and low mids, without sacrificing the top end. 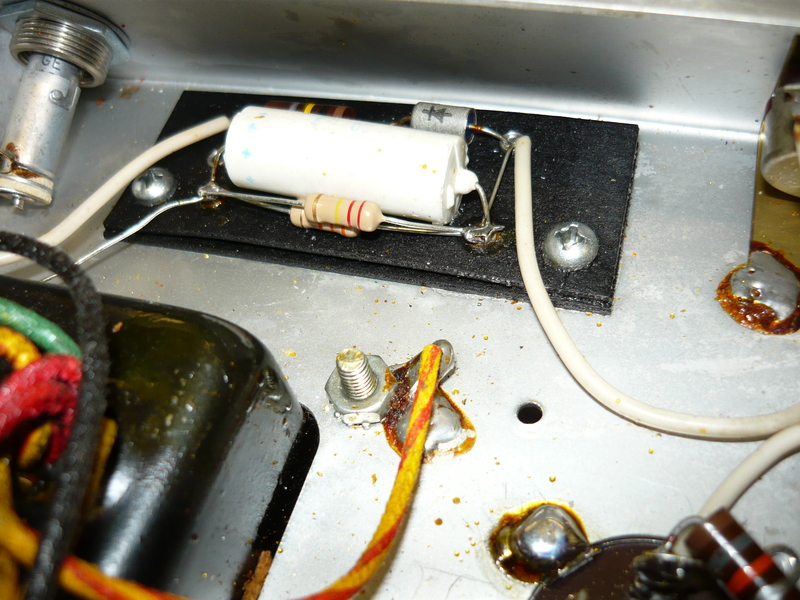 The first thing we noticed about the chassis, apart from the fact that everything including the valves (tubes) appeared to be original, was that the voltage selector was incorrectly set to 220V instead of 240V. These voltage selector switches have a pretty rubbery feel to them, and it’s quite easy to knock them off the required setting. 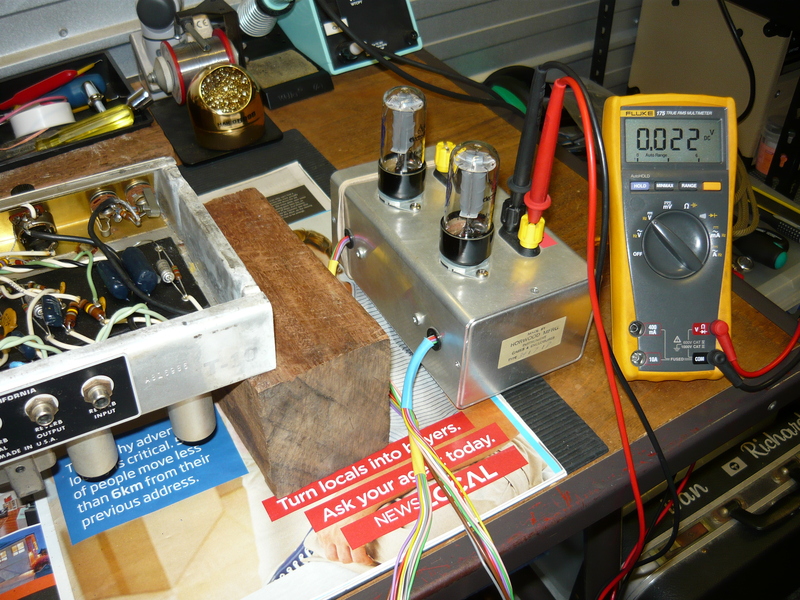 It does mean that this amp was being operated with higher internal voltages than normal. We replaced the intermittent power on/off switch with a Carlingswitch, and rewired the 240V primary so that the fuse is in series with the active (ie, brown) wire. We installed the correct value fuse for 240V mains, and replaced the 240V 3-pin plug. The amp passes the Workcover NSW electrical safety test without further problems. We cleaned all the pots with FaderLube, and the input jacks with DeOxit. This cured the issues with scratchiness. The main power supply capacitor was well overdue for replacement. This particular can-mounting capacitor is actually four capacitors in one single metal can, which is of course earthed (grounded) to the chassis. Fortunately these capacitors are being manufactured again by a USA based amp parts distributor, and we replaced the 20+20+20+20F/475V can. Before we could install a fresh matched pair of 6V6 output valves, a small upgrade was required. 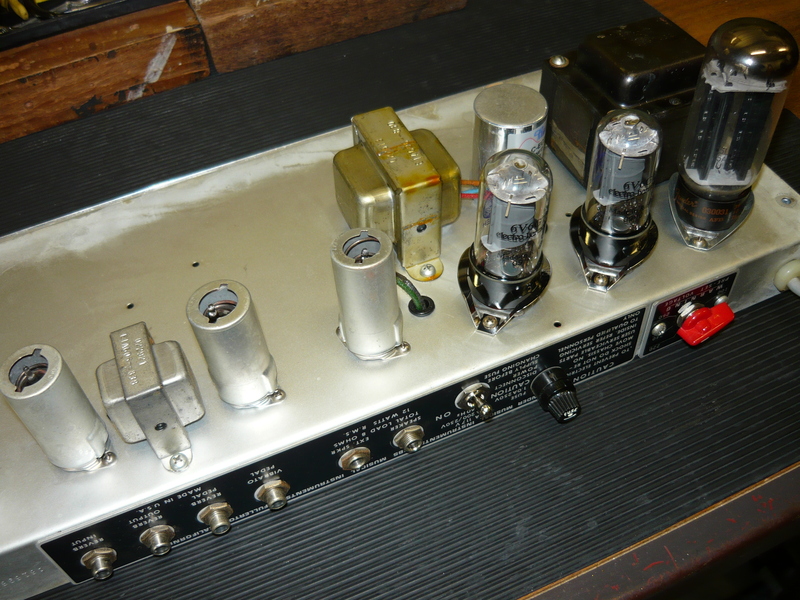 These amps were never originally built with screen grid resistors, which is NOT a great idea with modern valves (tubes). We installed a pair of 470 ohm 5 watt wire-wound resistors directly on to the octal sockets, and rearranged the wiring accordingly. This will help the 6V6’s to survive by limiting screen grid dissipation when the amp is driven hard, and also will contribute to amplifier stability. We set up the amp with a new matched pair of 6V6 output valves, and found that they were under biased, ie the quiescent no-signal current drawn was too high, exceeding the ratings of a 6V6 before actually playing a note. The bias supply in this amp is non-adjustable, so required paralleling of a pair of resistors in the circuit to set the desired bias voltage. An acceptable no signal current draw with the voltage conditions present in this amp is approx 22 to 24 ma per 6V6, which equates to around 9W anode dissipation per valve. We also installed a pair of spring clips to firmly hold the valves in their sockets. The final power output test and burn-in test revealed a power output into an 8 ohm resistive load, at the onset of clipping, of 11.75V/8 ohms = 17 watts (rms). 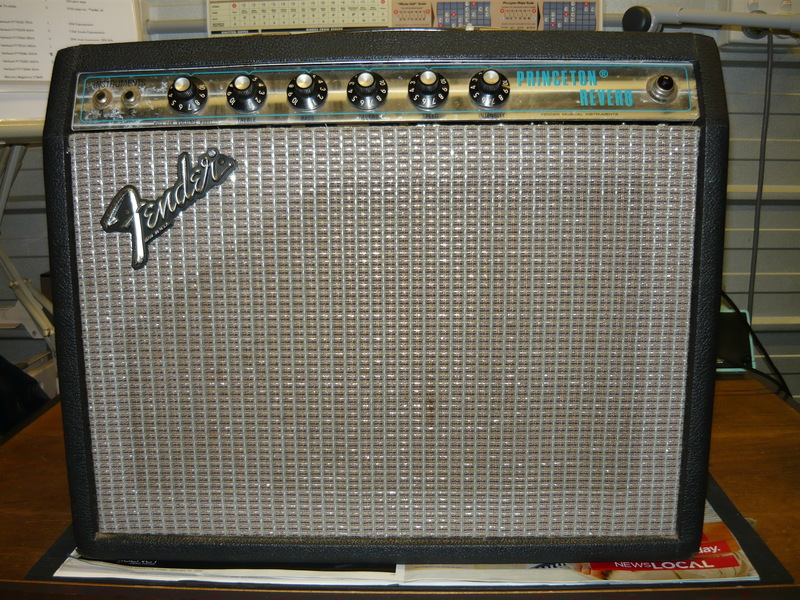 The clipping of the output signal is quite assymetrical, which is a characteristic of this particular amp design, or more specifically the type of phase-splitter employed. Don’t worry about the technical details – it sounds good, that’s all that really matters. So, how does it sound ? Well, the amp sounds very good at conversation levels, which is what I think the customer was anticipating, and it packs a punch as well, thanks to that speaker upgrade. The sound is very balanced now across the guitar spectrum, as compared to before. The reverb and tremolo are fine, with somewhat less depth than some of the bigger Fenders. The negative comments that apply to some of the Silverface Fenders, in particular from the late 1970’s, don’t seem to apply to the Princeton. 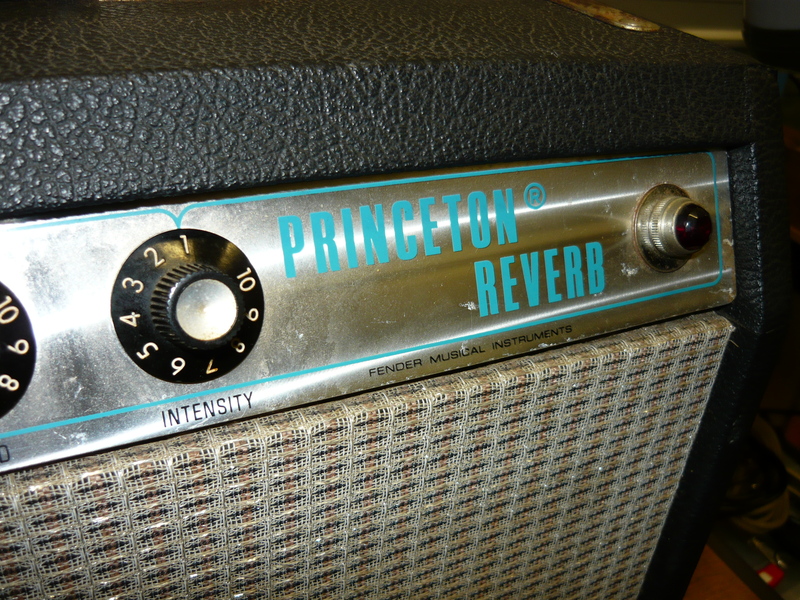 The schematic for the Princeton doesn’t seem to change very much at all from the Blackface to the Silverface models, so one possible theory is that the Princeton was considered so low down in the Fender amplifier heirarchy, that the engineering staff just left it as it was. Whatever the reason, I am quite impressed with the end result of this service and upgrade, and had a bit of a blast through it with a couple of my Telecasters. Many thanks to Ben for his custom and for supplying us with the subject matter for this week’s blog – IR. 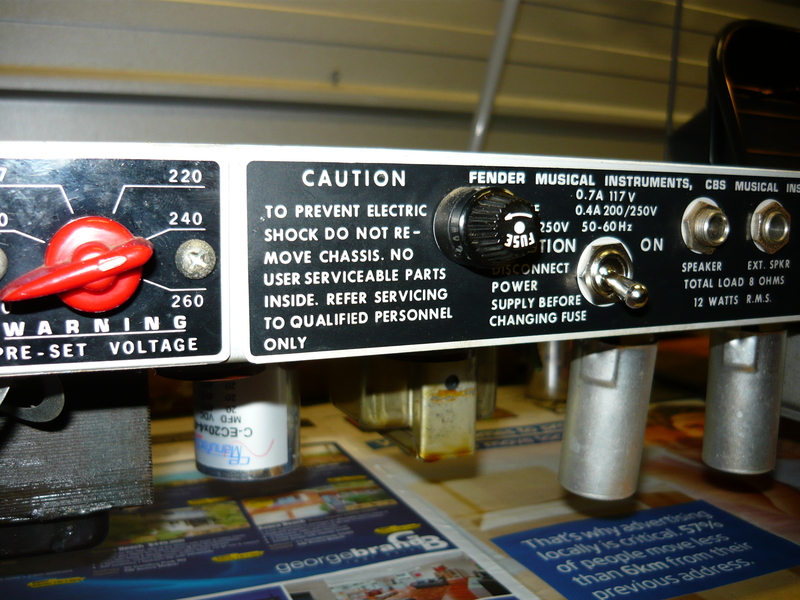 This entry was posted on June 2, 2012 at 9:23 am and is filed under Amp Repair, Amps. You can follow any responses to this entry through the RSS 2.0 feed. You can leave a response, or trackback from your own site. And being the “Ben the owner” of the subject matter in this week’s blog, I can only sing the praises of Ivan’s approach to this restoration and the eventuating results. This amp is WAY better than I expected – I am incredibly happy with the results and would not hesitate to recommend Ivan’s love and attention to any of your prized possessions. The tone coming out of this little practice amp is simply astounding – whatever you throw at it – single coils and humbuckers. I’m a very happy camper indeed!